Peaceful new log cabin on Lake Rhodhiss. Perfect getaway for fishing, swimming, boating, or just relaxing. Log cabin decks overlook the private dock with full view of the lake. Queen beds in Master BR, second BR on main floor bedroom, and queen bed and full size futon in loft. Full master suite with whirlpool tub and separate shower, plus second full bath on main floor, and full bath/shower in loft. Room to bring your boat, and 4 kayaks available for your use. Approximately one hour to Charlotte, one hour to Asheville, and one hour to Boone, so centrally located in the best of North Carolina. Excellent fishing lake, with minimal development. Watch American Bald Eagle pair annually build their nest, hatch and raise their baby eagles, less than a quarter mile away. House sits up above lake with a steep gravel driveway, with winding sloping path to dock. Lake Rhodhiss is not heavily developed, so there is not a lot of boat traffic, keeping it very peaceful. If there are very heavy rains, the lake can get murky, but does clear fairly quickly. Gated community has 3 miles of paved roads for biking or walking. We found this property in November of 2013, and immediately fell in love with it. This lake is a peaceful place, and we enjoyed it more and more every time we came, with the dream of building a log cabin on the property. This year we were able to realize that dream, and it is everything we had hoped for. We know you will enjoy it as much as we do. 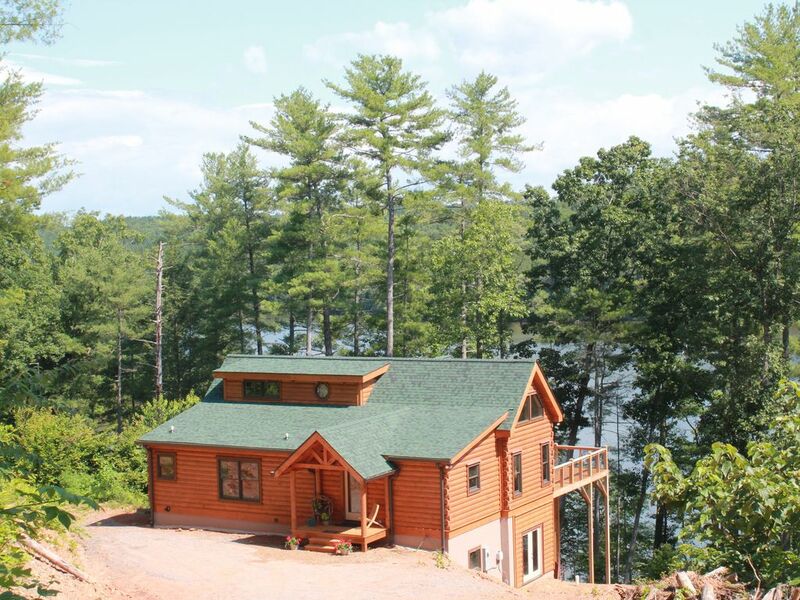 There is something very special about a log cabin on a lake. It is a dream vacation home. A beautiful, peaceful setting, very private and quiet, yet not far from desirable amenities. On the lake with private dock is the perfect place for swimming, kayaking, or just hanging out on the dock. Or bring you boat to ski, fish, or cruise the lake. Cabin was absolutely beautiful...enjoyed listening to the rain while curled up reading and playing board games on the rainy days and exploring the area when the rain stopped. Muffins, cookies, eggs and milk were a special treat on arrival and we found everything we needed and more in the cabin. We are already looking forward to our next trip to the Morganton area! Thanks for a relaxing vacation! We enjoyed a great long weekend staying in this beautiful home. Everything about the home was perfect, our boys had good luck fishing in the lake, and it was the perfect place to launch our gem mining expeditions to Emerald Village (Little Switzerland) and Emerald Hollow (Hiddenite). Wish we had more time, already planning a summer trip so we can swim in the lake. Wonderfully appointed and spotless home! Very secluded but short drive to Hickory, Morganton. Seeing TWO eagles perched side by side in a treetop (visible by boat) was spectacular and the highlight of the trip! Would definitely recommend this home for a quiet, relaxing get away. The owner reached out to us to make sure we were getting along and comfortable - very nice! As were the cookies, eggs, milk and bread!! Thank you for your hospitality!!!! Loved the cabin architecture and design. Lots of personal touches that made us feel welcome after a long drive! Super clean too! A great spot to get away from the world! We just returned from a 4 day trip. The cabin was as described and my family enjoyed all it had to offer. Dan and Jody were wonderful hosts and they made our "up in the air plans" seem easy to manage. The setting is quiet, very natural and the cabin was cozy and well furnished. This is an awesome property. Very clean and beautifully constructed. The lake is beautiful and quite. Our trip was short and slightly riddled with rain; however, we made the best of it. Thank you again for sharing such a beautiful property with us!